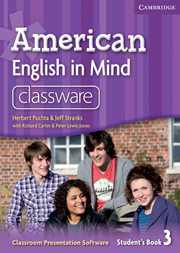 The American English in Mind Level 3 Classware features computer projectable versions of Student's Book lessons to facilitate 'heads-up' teaching. It encourages students to get out of the textbooks and participate. This software contains all of the lessons from the Student's Book, audio support, and associated video episodes. MORE! CIIP edition is a two-level course for upper primary students. Each level has the following components: Student's Book, Workbook, My Word Book (7e)/Language Book (8e), bilingual Teacher's Book (English/French), Flash Card pack, Class Audio CD set, dedicated website.